With chief minister Mamata Banerjee announcing certain posts in various state government panels to GNLF president Mann Ghisingh and Jan Andolan Party president Harka Bahadur Chhetri, the Gorkha Janmukti Morcha has slammed them for selling off and exchanging the statehood demand to secure these posts. On Wednesday in Siliguri, the chief minister also announced the names of hill TMC leaders Shanta Chhetri as a member of the Advisory Council of Tea Directorate and Sardha Subba Rai as the director of the North Bengal State Transport Corporation. Ghisingh has been made the vice-chairman of the North Bengal Board for Development of Sports and Games while Chhetri has become the vice-chairman of the Uttarbanga Unnayan Parishad. GJM assistant secretary Binay Tamang said, “We congratulate them, especially the hill TMC leaders, who were given important posts by the chief minister. We have nothing to comment on this as the chief minister can do so in her official capacity. But what came as a surprise was the GNLF and JAP presidents getting posts. Once again it has been proven that the JAP and the TMC are one and the same body as during the Vidhan Sabha election too, Chhetri's name had been initially announced by Mamata as a TMC candidate. When the JAP was formed, they had said they had prepared a roadmap for Gorkhaland, but now this has been proved otherwise,” said Tamang. Tamang further said that the chief minister's announcements was a clear indication that the three parties would join hands in fighting upcoming elections, but this would not affect the Morcha at all. When Chhetri was contacted, he said, “I thank the chief minister for announcing my name as vice-chairman of the north Bengal development board and once I receive official intimation I will see what I can do to help the people.” Commenting on the allegations made by the Morcha, he said, “It is the GJM who is not sincere about the Gorkhaland demand and use it as an issue only during elections. They mainly criticise our party as we have done so much in such little time; they are afraid of losing popular support as they have not done anything. Ghisingh has been made the vice-chairman of the North Bengal Board for Development of Sports and Games while Chhetri has become the vice-chairman of the Uttarbanga Unnayan Parishad. 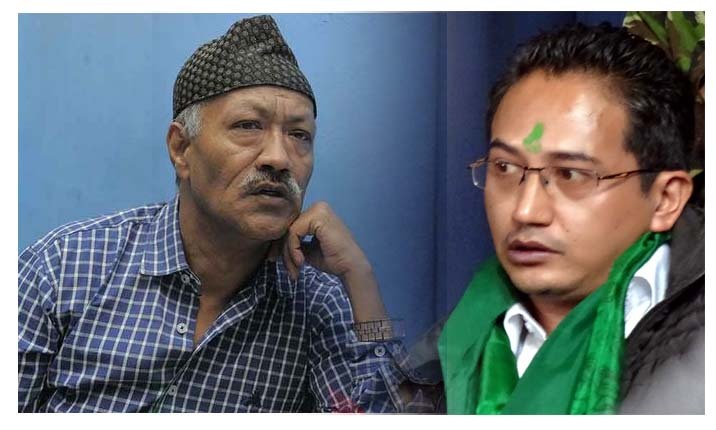 GNLF president Mann Ghisingh and Jan Andolan Party president Harka Bahadur Chhetri, the Gorkha Janmukti Morcha has slammed them for selling off and exchanging the statehood demand to secure these posts.